SuperPhillip Central continues its review frenzy with another iOS and Android game. 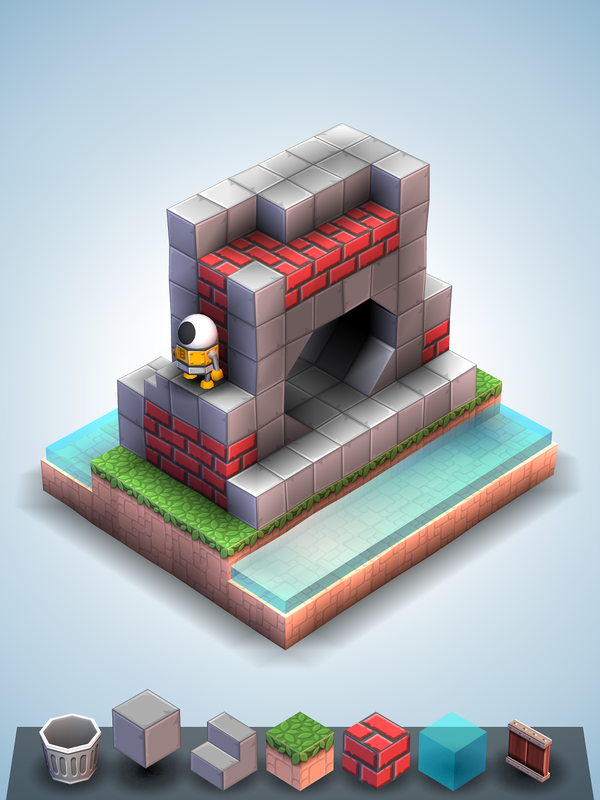 This time it's an isometric puzzle game called Mekorama. It's definitely worth checking out, and this review pieces out why! Isometric puzzle games are quite fun, and they're especially handy on mobile devices. You can turn on your phone or tablet, jump into a level, beat it, and then go about your day. There's something cool about having a miniature world in your hand where you can interact with it in ways that are highly enjoyable and engrossing. Of course, the poster child for this type of game on mobile is Monument Valley, but there are other games in the genre of puzzle titles on iOS and Android. One of these is Mekorama, a game primarily designed by one person that delivers some brain-twisting gameplay and pleasant charm. 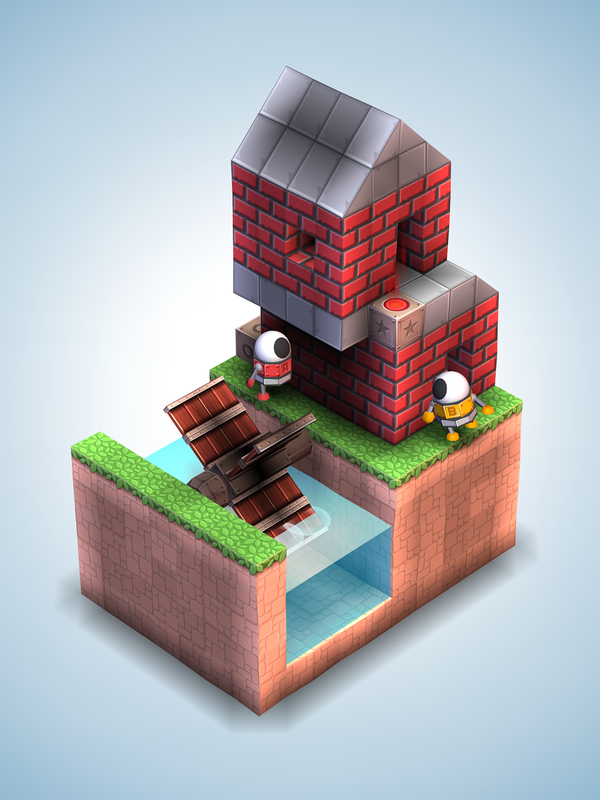 The goal of Mekorama is to guide a little robot through isometric obstacle courses of sorts, leading him from the start of each level to the goal. This is performed through tapping the screen to guide the robot. Levels are made out of a grid format, so tapping the correct space usually isn't too trying. Though with a screen with little real estate like on my iPhone 5S, I did occasionally tap the wrong space. Zooming doesn't really help for the most part, as the zoom function (done by pinching the screen in and out) doesn't zoom in on your robot. It zooms in on the center of the level. As levels are sometimes spread out horizontally rather than vertically, this can be an annoyance. Regardless, if you're able to move the robot to the given space you tap on, a small white circle will briefly appear, showing that the robot will move to the space. If it cannot, due to an object or obstacle blocking the way, then a red X will show up on that space. Additionally, you can spin the level around in 360 degrees to get a full view of the obstacles in a level that await your robotic buddy. Levels are devised up by one major move necessary to reach the goal in the beginning levels, and ramps up to eventually have a series of maneuvers required to reach the goal. In levels you can move and shift specific blocks around to transport the robot around when he stands on them to access new portions of the levels. Sometimes you'll even need to fall from higher elevations to reach lower platforms, or enter into building-like areas and come out from another side. While the level design of Mekorama is generally good, there are some really poorly executed designs. Anything where you have to slowly push another moving character by tapping a space next to it to inch it along is annoying and quite tedious. Some levels require such precision timing that if you foul up, you essentially have to restart from the beginning. Since some levels can take minutes to complete, this can be quite the bother. There are also non-puzzle oriented levels like one where you have to guide a ball on a balance beam, carefully shifting the weight so the platform the ball rolls on doesn't topple over. For a supposed game to relax to, Mekorama doesn't always deliver a laid-back experience. The 50 levels included in Mekorama are just a primer for the main feast of content in the game, the level creator. While some kind of tutorial to use the actual creator would have been appreciated, what you're able to do with it is use the same tools that the developer used to create the already included levels. This is where Mekorama truly shines. Through tapping blocks on the bottom of the screen and placing them in the blank canvas available to you (though another bother I have is that there is no grid available for easier building), you can build your own crafty concoctions, and then save them to your game. Each level you create gets its own QR code that you can share online. Whole communities and websites are dedicated to the publishing and sharing of levels via these QR codes, so if the developer's initial 50 levels already included with Mekorama don't give you enough content, the created levels by the community surely will. In this regard, Mekorama is a fantastic value. It's even a better value when you consider the price tag. Mekorama itself is free, but you can make a purchase between 99 cents and around $30 to support the developer as well as gain the ability to be provided in-game hints towards the 50 included levels. Though, the latter isn't much of a bonus as online walkthroughs are common in the digital age. Regardless, it's a wonderful way of being able to give money to the developer, and even if you don't, you have the full game available to you. The only thing that comes up are occasional "do you want to support the developer?" prompt between every three or four levels that takes you to the purchase page. 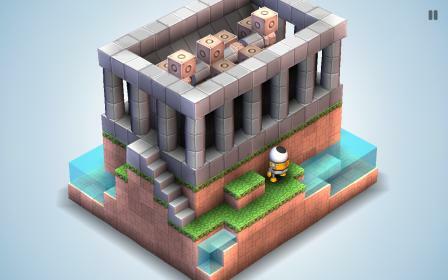 Mekorama leads you into some relaxing and rewarding experiences, allowing you to use that ol' noggin of yours, solve some puzzles, and gain some satisfaction in doing so. Some of the included levels are more annoying to play than others, but even if you don't even touch them, you have a theoretically infinite amount of levels available to you via the community. Building your own levels to share is fun, though it takes some learning to get the process down pat. Overall, Mekorama is a free download that serves as a reminder of why a lot of people love puzzle games like this, and why Google Play and the App Store are great avenues to find little hidden treasures like this game and others like it.